Unhappy with the rule of the Roman Procurators, the Judaeans rose up in open revolt in 66 CE. Anti-Jewish posture of Procurators Gessius Florus (64 - 66 CE), led in 66 CE to the decisive and final outbreak. Gessius Florus allowed the Greek population of Caesarea Maritima to massacre the Jews of that city with impunity. Greeks in other towns of Judaea repeated the assault on Jewish populations. In turn, the Jews slaughtered Gentiles in Samaria, Galilee, and elsewhere. The revolt withstood the Romans for several years. 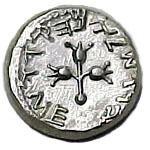 During this period, the Jewish people struck a different types of coins. In 67 CE, Vespasian and his son Titus were sent with a force of about 60,000 men to put an end to the revolt. Galilee was captured in 67 CE and Judaea was captured with the fall of Jerusalem in 70 CE. Jerusalem was sacked and the Second Temple was destroyed. 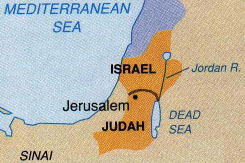 Judaea came under direct rule of Rome. Obverse : A narrow-necked amphora surrounded by a Hebrew legend year 2 (67 CE). Reverse : A Vine-branch with a single leaf, surrounded by Hebrew legend Freedom of Zion. 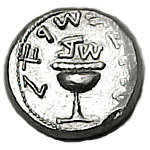 Obverse: Chalice withg pearled rim. Legend - half Shekel. Reverse: Sprig of three pomegranates. Legend - Holy Jerusalem.